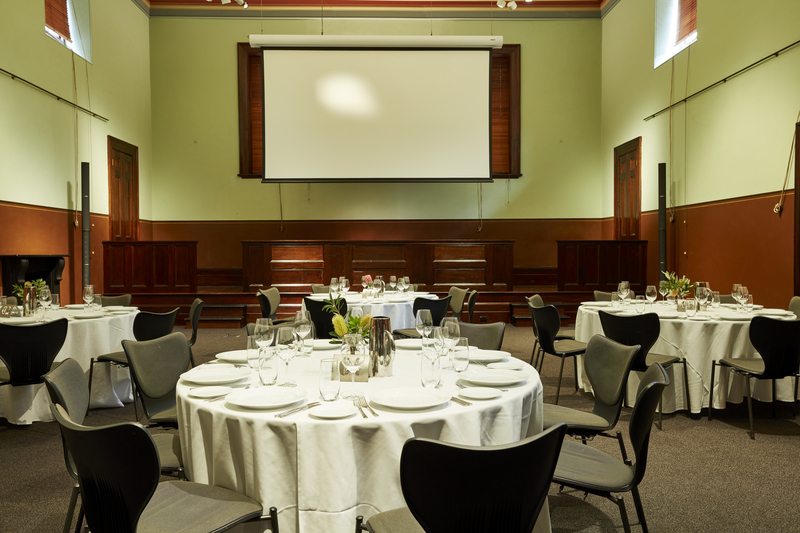 Overlooking Circular Quay in Sydney’s CBD, the Justice & Police Museum has a rich and colourful past and provides a fascinating setting to host a range of events and experiences. 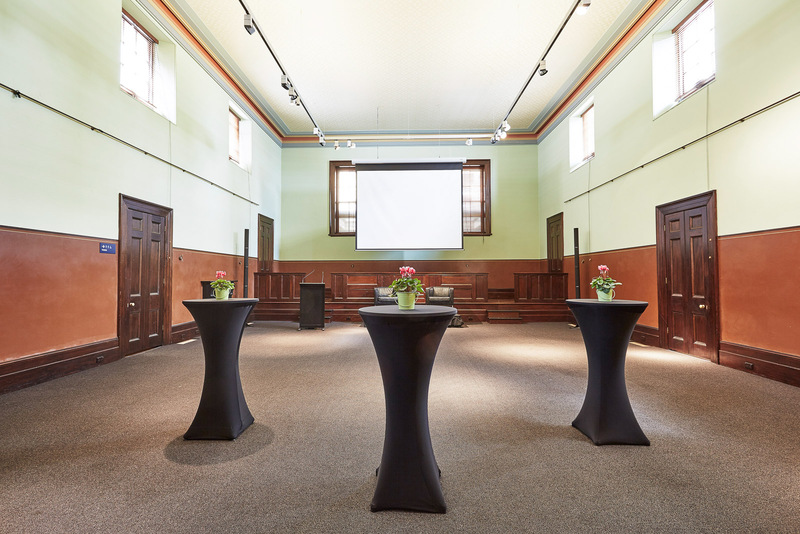 Full of character, the beautiful wood-panelled rooms provide a unique backdrop for your event. Enhance your upcoming event with our exclusive themed venue and furniture hire packages in collaboration with Event Hire Services. Create maximum impact with vintage copper and leather pieces, relax and unwind with fresh summer-white decors or re-create the 1920s with luxe black-and-white statement pieces. Download package here or contact our Venues Services team here. Complete with data projection and large screen, the Water Police Court can accommodate 20-120 people for conferences, webcasting, product launches, cocktails and dinners. 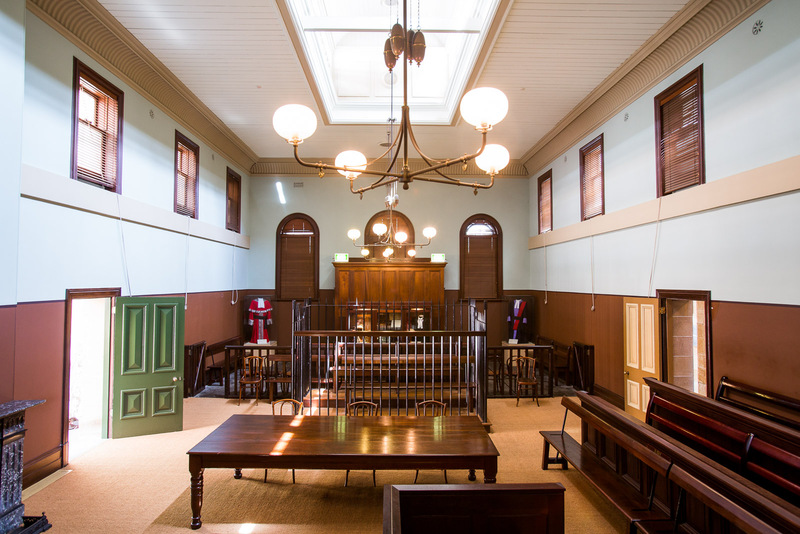 This heritage courtroom features a magistrate’s bench and canopy, high ceilings, beautiful wood panelling and excellent acoustics. 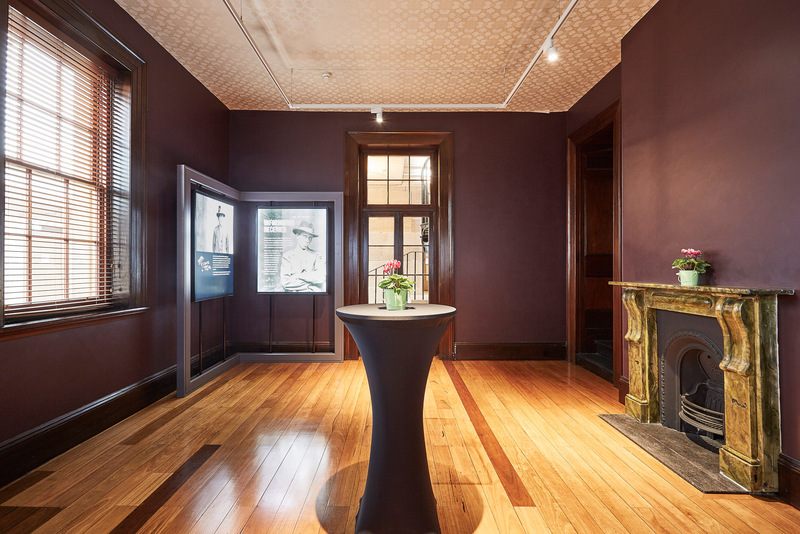 Innovative built-in lighting options for day and evening make this a versatile venue for all types of events. 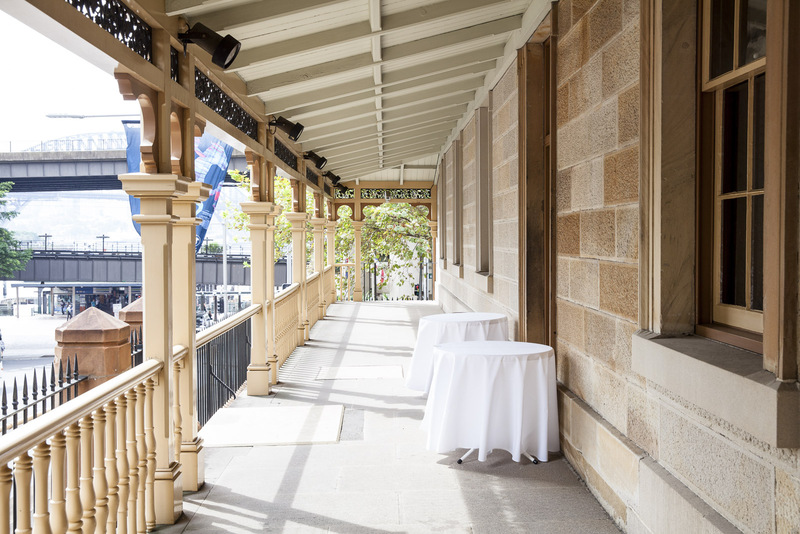 The adjoining Summons Courtroom and covered sandstone verandah overlooking Circular Quay provide indoor/outdoor areas for refreshment breaks, cocktail parties and pre-dinner drinks. 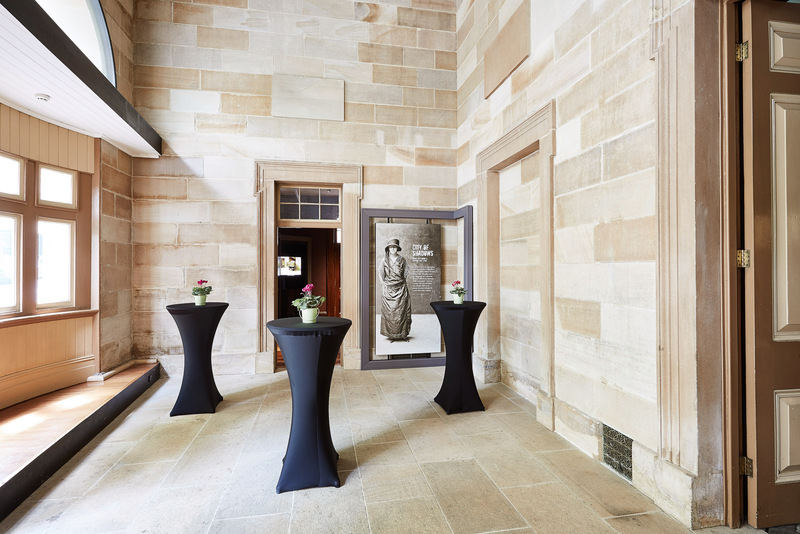 This room houses the fascinating Notorious Criminals permanent exhibition, and features natural light, high ceilings and direct access to the spacious original sandstone verandah overlooking Circular Quay. The Summons Courtroom is ideal for pre-function and breakout events, cocktail parties, and small lunches and dinners, which can be set with banquet rounds or one long table. 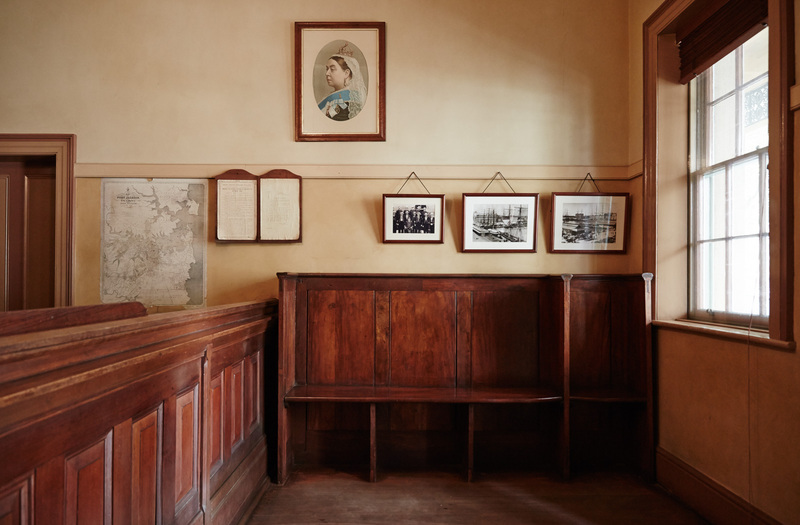 Bring the venue’s past to life for your guests with a mock trial in the Police Court, which retains the original magistrate’s bench, reporter/jury box, witness stand and prisoner’s dock. It is also an unusual venue for small dinners and presentations. To build atmosphere, have your guests enter via the adjoining charge room and welcome them at the original charge desk. From there, walk the corridor of cells and see the chilling collection of criminal weapons, building anticipation and suspense for their eventual arrival at the Police Court for the main event. Integrating performers to play the parts of some of the colourful characters connected with the site enhances this experience even more. Sandstone Verandah, Justice & Police Museum. Please note that the service of red wine is limited due to the conservation requirements of the original sandstone. Minimum spend applies. 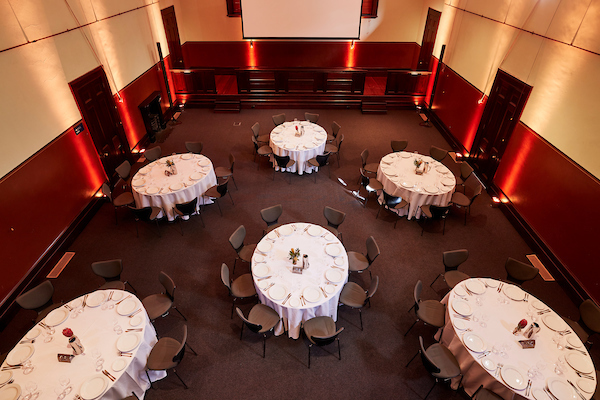 A dedicated member of our friendly Venue Services team at the Justice and Police Museum will work closely with you to create a successful and memorable event for your guests. WiFi is provided for delegates and guests attending events at The Justice and Police Museum. The Justice and Police Museum houses the Water Police Station, Water Police Court and Police Court that once made up one of the city’s busiest legal hubs. Crooks and cops, thugs and judges, locals and drifters - the guilty and the innocent have all left their stories here. Give your guests a fascinating behind-the-scenes perspective with a specialised curator-led tour – don’t miss the museum’s extraordinary collection of police forensic photography, dating from 1912 to 1948, in the City of Shadows exhibition. We can also arrange special viewings of the museum’s private collection. 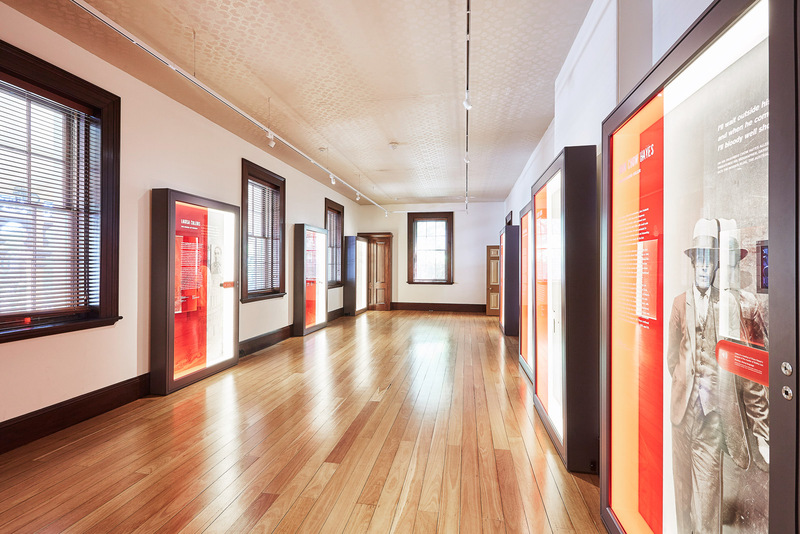 This collection contains forensic evidence from some of the state’s most infamous crimes including the Pyjama Girl murder, and weapons and other items alleged to have belonged to bushrangers such as Ben Hall, Thunderbolt, the Kelly gang, the Clarke gang and Frank Gardiner. A plaster death mask of Andrew George Scott, alias Captain Moonlite, made shortly after his execution, has particular resonance as he is known to have spent time in the Water Police Station. Please speak to our Venue Services team for more details. The Justice and Police Museum is located on the corner of Albert and Phillip streets, Circular Quay, Sydney. There is no public parking available, however, the Sydney Opera House Car Park offers an early-bird rate and is a short walk from the museum. For public transport options please go to the Visit the Justice & Police Museum page.